The question of what is the best acoustic guitar for beginners is one that isn’t given nearly enough thought by most people. The fact that you are searching for information on this, puts you ahead of most other beginner guitarists – because the guitar you start out on will have a big impact on your progression and your future on the instrument. 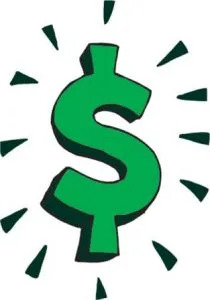 Too many people just go with the cheapest piece of junk because they don’t want to spend too much on something that they maybe aren’t yet sure how long they will be continuing with just yet. This is understandable but also can lead to getting a guitar that will ensure you don’t play for long. And the truth is there are some really decent guitars that are well suited to beginners out there that won’t cost you an arm or a leg and will help you to progress quickly. What to Look out for in a Beginner Guitar? Playability is more important than sound for the beginner – in my opinion. You want a guitar that is nice and easy to play so that the new guitarist enjoys playing. The more someone enjoys playing, the more often they will play and the more often they play the better they will get. But sound and budget are also important factors. If you are just a beginner then there is not a lot of point in spending too much a guitar. You won’t have the ability to appreciate the characteristics that make the high end guitar more expensive. And you probably aren’t sure how long and how often you are going to play at this stage. However, as alluded to earlier, you also definitely don’t want something that is complete rubbish and is going to be hard to learn on – and sound terrible – this is a great way to put the beginner off guitar for life! Too many people say something like “this is a great guitar for a beginner” just because it’s cheap – or in some cases because it’s crap! This is definitely not the best way for a beginner to start out. There are some decent sounding, easy to play guitars that you can get for a reasonable price so no need to get complete garbage and definitely not a good idea to get complete rubbish for a beginner. Check out the link below for some great beginner guitars at a reasonable price. Just like if it’s hard to play, if it sounds too bad then that is another great way to put off the beginner. There are actually some decent sounding laminate wood guitars that sound good enough and should be easy on the wallet. If possible though get a guitar with a solid top (soundboard) and the back and sides can be laminate. There are some cheap ways to make the guitar sound better too. The second easiest one being replacing the bridge saddle, bridge pins and nut if the original ones that came with the guitar were cheap plastic ones. You should be able to pick up a set of these in either bone or artificial bone for no more than $15 to $30 and this should make a big difference to your sound. The easiest way to make your guitar sound better is to change the strings. Cheaper guitars often come with cheaper strings. So the first thing you want to do is get different strings. This will make a big improvement on the sound – and chances are that the strings that come with it aren’t going to be strings ideal for the beginner anyway. If you are buying a guitar for a child or if you are a smaller person or have smaller hands then it’s a good idea to go with a smaller sized guitar. This might be a mini sized guitar, parlour guitar, concert guitar or grand auditorium. You can go for one of these sizes no matter your physical characteristics but they’re particularly good for smaller sized people. Playability, in my opinion, is the most important factor for a novice guitarist. If you don’t enjoy playing your instrument you aren’t going to stick at it for long – and you aren’t going to enjoy the process. Thankfully there are a couple of fairly easy things you can do to improve the playability of your guitar both in the buying process and things you can adjust after buying. You will want to find something that has a nice low action or make sure to adjust the action so that it’s low enough or have someone adjust it for you. The easiest way is to get a guitar that already has a reasonable action on it. 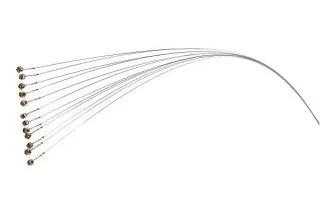 Get strings that help make fretting easy and are easy on your fingers – check out the post below for more information on getting the best strings for a beginner. Note: Don’t go for nylon strings unless you want to play the style of music that suit nylon strings. 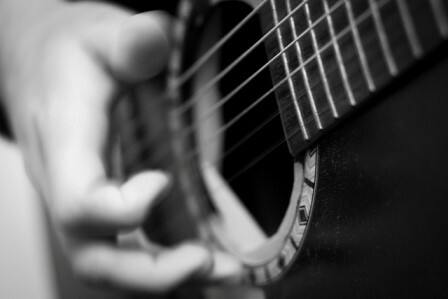 If you go for nylon strings you will need to go for a classical guitar. If you want to play the styles of music that are good with a classical guitar then of course go for a classical guitar, but otherwise don’t. As you will see in the article at the link above there are steel strings you can get that will be well suited to the beginner. Now let’s talk about the shape of guitar you should go for as a beginner. This is also a playability factor. If you are looking to play classical, flamenco etc then a classical guitar is the best way to go (see right hand shape in the picture to the right). There isn’t much variance in shape for classical guitars so find one that is in your price range. All classical guitars have great shapes for beginners. 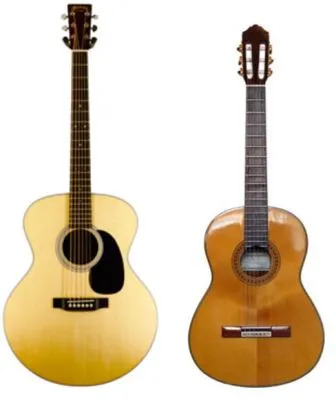 If you are going for a steel string (best for rock, pop, blues, country e.t.c) there are a couple of main shapes – the Dreadnought and the Grand Auditorium (see the left guitar in the picture on the right). The Auditorium will be easier for a beginner to learn on because it is a bit smaller so easier to handle and is shaped better for playing sitting down. Similarly the Concert shape is good too but these are less common. Dreadnoughts are the most popular shape these days so it’s likely that there are more options for dreadnoughts but there are plenty of options for Auditoriums too. If you decide you want a dreadnought later you can always sell your auditorium and buy a dreadnought. You can also get mini-dreadnought shapes which can be a good compromise. But Won’t Playing a Harder Guitar be Better in the Long Run? I don’t subscribe to the theory that playing on something more difficult is going to pay off in the long run. That’s like saying if you learn to drive in an 18-wheeler truck then going to a normal car is going to be easy. Whilst it is true that driving a car will feel easy after a big truck, you’re going to have some bad habits and poor techniques. In order to drive the truck without killing yourself you had to learn quickly and crudely to just survive. Learning quickly and crudely and under pressure has been shown, scientifically, to make you learn poorly. Hopefully now you know a little bit more about the type of guitar you should get if you are a beginner or buying for a beginner. These little things can make a big difference to the speed of your progression and your enjoyment of playing the guitar. If you have any questions or comments they are very welcome in the comments section below. And if you are a more experienced guitarist or teacher reading this and have any other tips for beginners in terms of guitar specifications it would be awesome to hear what you think. Check out some of my list of what I consider to be the top 6 beginner acoustic guitars at the link below.